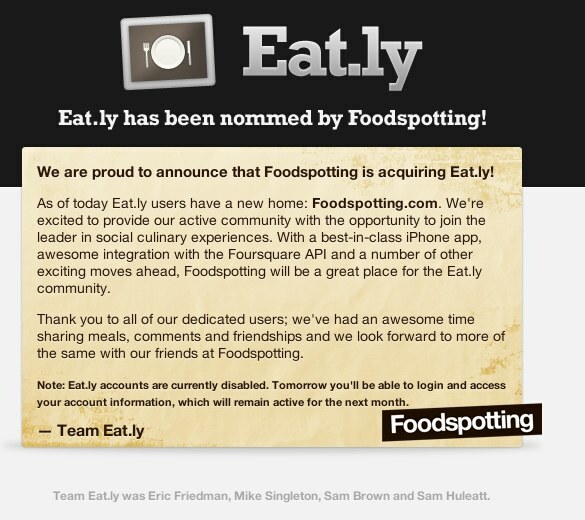 Foodspotting, the service that allows you to take pictures of your food to share with others, is acquiring a competitor in the space: Eat.ly. Financial terms of the deal were not disclosed. Eat.ly’s team writes: With a best-in-class iPhone app, awesome integration with the Foursquare API and a number of other exciting moves ahead, Foodspotting will be a great place for the Eat.ly community. Eat.ly, which was founded by current Foursquare employees, is sort of like a Flickr for food—it allows you to keep a visual record of meals you’ve eaten, and then share your images with friends, family, or social networks. Users could also rate meals using our ‘healthiness scale’ of 1 to 100. Foodspotting goes beyond just the sharing component and allows users to rate foods, find food they might enjoy by their location and more. Foodspotting currently has nearly 500,000 users and 10,000 new photos are uploaded to Foodspotting each week worldwide. Foodspotting, which offers a popular iPhone app, is on a roll. The startup hjust secured $750,000 in new funding and scored deals with both Zagat and The Travel Channel for partnerships.